Is something wrong with WASR-2s? I keep seeing them on gunbroker go for far less than I would expect factory-built -74s to go for in 2018. Like $500-700. So is there some quality issue I don't know about or what's the deal? People seem to love the WASR-10, so are they made differently or what? Most people want AK-74s from Russia or Bulgaria. The Polish and Romanian offerings never really caught on as much. The Romanians suffered from being bunched in with the early WASR hate and Polish Tantals had manufacture problems that resulted in rifles having issues with keyholing. Check the gas block alignment with the gas port. They have a 90° gas port with a 45° gas block, and they sometimes miss the hole a bit. I will swear no oath. Crowned by god not by the church, as my power is divine. If America should die before I wake. I'll put an extended mag inside of my AK. Its simple; people just don't know about them. The WASR2 isn't in the general thought bubble, so people don't look for them, thus prices haven't risen. If AKOU did a test on one? Then people would be singing their praises overnight and prices would shoot up. I saw something similar happen with the OPAP a couple years ago. Last edited by Charlemagne; 08-20-2018 at 02:10 AM. 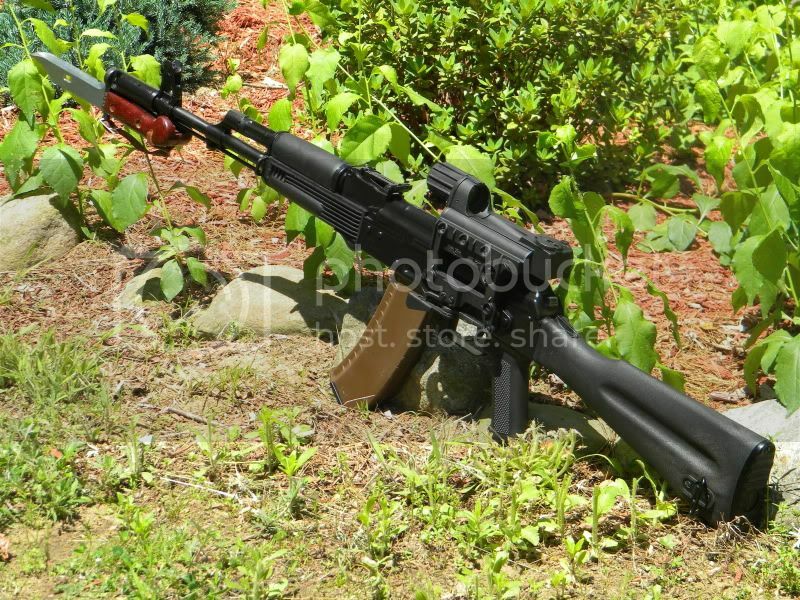 ^^^^ Pretty much this as well as some build issurs as on other earlier generation WASR rifles. Most are fine and a few problematic. It cycled and fired but the gas piston was binding etc. , and it bugged me. I returned it for exchange and the replacement was fine. I still have it and recently did a facelight on it. Last edited by AKBLUE; 08-24-2018 at 04:00 PM. Mine has feeding/ejecting issues. It's a project for some day. They're often very rough rifles, but they generally work and would make fine beater rifles. I would not want to go over $550 for the WASR 2s or 3s. They're too rough to warrant higher prices. And I've never said that about any other Com-Block AK. A cheap gun that's going for about double what it was new. When it was new no one wanted them hence why they were cheap and Century stopped importing them. Now people are desperate for any import hence higher prices. Not unusual., Romanian M64 RPK, WASR, Chinese pre ban AK, Chinese Post ban AK, Chinese SKS, Zastava SKS, Hungarian Kassnar, Russian 91/30 and other Mosin Nagant rifles etc., etc. All sell for multiples of 100% to 500% of original retail. No WASR2s, but have the Romak II, and it's bomb proof. Straight components, upturned charging handle, and eats whatever you put in it. Great rifle. "To know who rules over you, simply find out who you are not allowed to criticize." We used to build from kits with hand bent flats because we could build a nicer rifle than what some of these turds were from the factory. They sways xhot but IMO they were poor quality..
Now guys wet there pants over them becuase they have a original barrel and commie dust on them. It's crazy how much things have changed in 16 years. Can I ask what FSB that is AKBlue? It is one of the IO., Inter Ordnance offerings. They are offered by the IO and some through Arms Of America etc. I cut the top of the circular globe off to open up the sight picture. They were like $35 at one time. The make them now in 90 and 45 degree and with or without the muzzle device plunger/retainer holes etc. The WASR-2 barrel is thinner than the AK-74 barrel in front of the gas block and then thinner again at the front sight base journal. Many of the magwells are cut really rough and oversize. Nope nothing wrong with them. The upturned handle is lil strange. But they go bang and are a good shooting rifle. About as accurate as the SLR-105 I had. Last edited by AK-ula; 08-25-2018 at 08:00 PM. Does it stabilise the round under 25 yds? Aside from the lack of popularity ppl actually interested in Romy/AIMS74 series of rifles would rather buy earlier imports like the Intrac MKII, CUR-2, or SAR-2 which came with dimpled receivers and a better fit/finish then wasr-2s and generally for only a couple hundred more. Nothing wrong with Wasr2's just kind of ugly. I prefer dimps and lugs on all my AK's. The wasr2 I had ran like sewing machine and was pretty accurate. Magwell was cut a little rough and some mags didn't fit. WASR 2's are good to go. I love mine. As stated, it's a lazer!! Romak 2 is a laser... WASR 2 good also... They're P md 86s now...! And the link to see them better.. Stupid new imgur! Last edited by panzertruppe; 10-07-2018 at 11:22 PM. Ditto...wish I hadn’t sold it.